Marine GPS Antenna offers 5 times/sec position update rate. Optimized for sensitivity, accuracy, and rapid acquisition times, 5 Hz GS15 comes in 3 in. housing and is compatible with WAAS, EGNOS, and SBAS. Exact Course Over Ground (COG) feature, usable at any speed as well as in tight turns, offers users precise chart synchronization. Fully waterproof unit also includes 16-channel receiver that provides rapid signal acquisition and locking capability, promoting faster start position location and consistent position accuracy. Nashua, N.H. - Simrad-Yachting, a leader in the design and manufacture of world-class marine navigation, auto-steering, safety, communications and fishfinding systems, announced today the availability of its high-speed GS15 5Hz GPS antenna. Giving recreational boaters the first true satellite update rate of 5 times per second, the GS15 provides advanced performance, industry-leading sensitivity and accuracy, and rapid acquisition times-all in a compact, easy to mount 3-inch housing. Delivering exact Course Over Ground (COG) detail at any speed, pairing the GS15 with Simrad-branded multifunction devices or any other compatible navigation system, offers users precise chart synchronization, even when maneuvering at fast speeds or in tight turns. "The Simrad GS15 trumps the performance of standard marine GPS antennas," said Louis Chemi, chief operating officer, Navico Americas. "Offering boaters improved first fix rates, lightning-fast signal locking and resistance to interference, the new Simrad 5Hz antenna is the perfect complement to our Simrad-Yachting performance navigation systems." The GS15's 16-Channel receiver provides boaters rapid signal acquisition and locking capability resulting in faster start position location and consistent position accuracy, even in conditions where poor satellite configuration can affect standard 12-Channel receivers. Ideal for tracking a high-speed powerboat's rapidly changing position, the GS15 eliminates "jumping" on the chartplotter. WAAS, EGNOS and SBAS compatible, the rugged, fully waterproof Simrad 5Hz antenna includes an adapter for optional pole mounting. 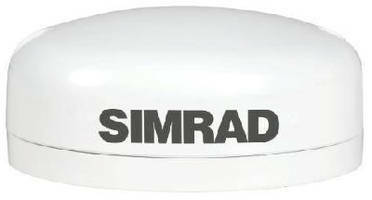 The Simrad GS15 high speed 5Hz GPS antenna has a retail price of US $339.00, and is available from authorized Simrad dealers and distributors throughout the United States and Canada. For more information on the Simrad GS15 antenna, or the entire line of Simrad branded professional-grade marine electronics, please contact 800-628-4487 (toll-free) in the USA or 800-661-3983 (toll-free) in Canada, or visit www.simrad-yachting.com. The Simrad-Yachting brand is wholly owned by Navico, Inc., a privately held, international marine electronics company. Navico is the world's largest marine electronics company, and is the parent company to five well-established marine electronics brands: B&G®, Eagle®, Lowrance, Northstar and Simrad®.